The Hythe Imperial Hotel is a grand Victorian mansion seated on the coast of the English Channel. 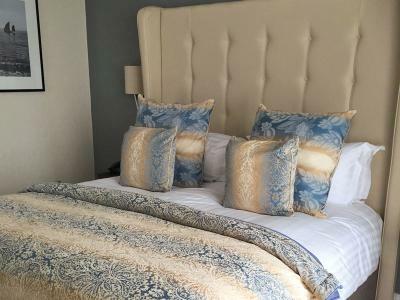 Surrounded by the Kent Downs Area of Outstanding Natural Beauty and a short drive from the Dover-Folkestone Heritage Coast with the soaring White Cliffs of Dover, England’s spectacular land and seascapes really are at its doorstep. Rooms are individually designed, many with sea or golf course views and all with free Wi-Fi and smart TVs. Suites include the Belcourt with 180-degree sea views and a roll-top bath. Fresh fish and seafood features on the menu at the award-winning Coast Restaurant, whilst The Holy Pundit’s bold flavours are typical of Indian fusion cooking. Uniquely, the Hythe Imperial Hotel’s health club features a comprehensive fitness class timetable and a dedicated personal training team. ESPA treatments such as ‘body cocoon’ pamper guests with essential oils, plant extracts and aromatic balms. The 9-hole golf course offers breathtaking views of the English Channel and the Royal Military Canal. Hop aboard Kent’s ‘mainline in miniature’ at Hythe to explore some of the county’s iconic natural landscapes, or take a walk on the wild side at Kent’s only safari experience, Port Lympne Reserve. The Hythe Imperial Hotel’s enviable position puts it in close proximity to Dover Ferry Port, Eurostar, Ashford International and Canterbury. 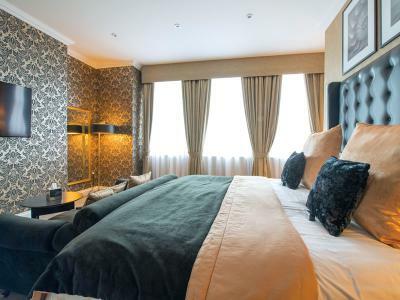 Wake up to 4-star Victorian grandeur right on the seafront. 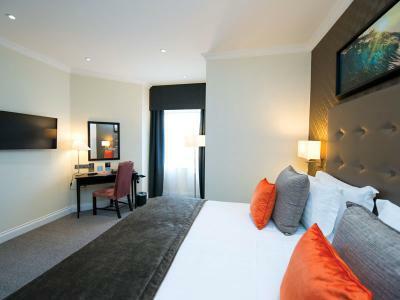 Bedrooms are individually designed and offer free Wi-Fi and smart TVs. Many enjoy stunning sea views of the English Channel. 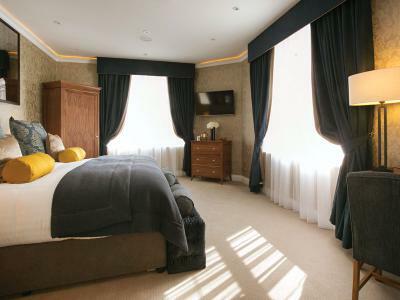 For a special occasion, choose from a range of junior suites: the Saltwood features a full-size Jacuzzi bath with flat-screen TV, a large double shower and views over the rolling hills of Hythe; the Hythe has a four-poster bed and enjoys sea and golf course views through its floor-to-ceiling windows; and the Albert has an ornate wooden bed with matching furniture. 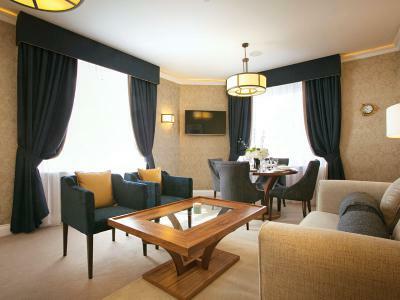 Or, for the ultimate in luxury, the Deluxe and Belcourt suites feature separate lounges with stunning sea views. Room service is available. 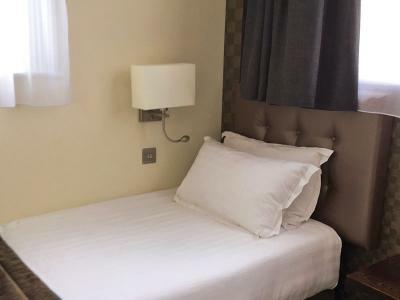 Contemporary style en suite bedroom offering free Wi-Fi, air-conditioning, 34" smart TV, digital radio, fridge, writing desk, direct dial telephone, dataport, alarm clock, ironing station, tea and coffee making facilities, mineral water, toiletries, and hairdryer. King bed. 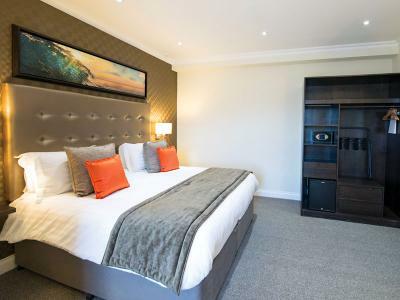 Contemporary style en suite bedroom offering free Wi-Fi, air-conditioning, 34" smart TV, digital radio, fridge, writing desk, direct dial telephone, dataport, alarm clock, ironing station, tea and coffee making facilities, mineral water, toiletries, and hairdryer. King bed. Sea views over English Channel. 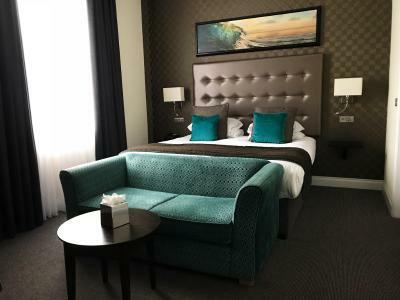 Contemporary style en suite bedroom offering free Wi-Fi, air-conditioning, 34" smart TV, digital radio, fridge, writing desk, direct dial telephone, dataport, alarm clock, ironing station, tea and coffee making facilities, mineral water, toiletries, and hairdryer. King bed & sofa bed. 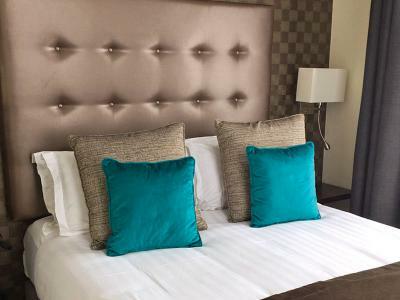 Contemporary style en suite bedroom offering free Wi-Fi, air-conditioning, 34" smart TV, digital radio, fridge, writing desk, direct dial telephone, dataport, alarm clock, ironing station, tea and coffee making facilities, mineral water, toiletries, and hairdryer. King bed and 2 single beds. 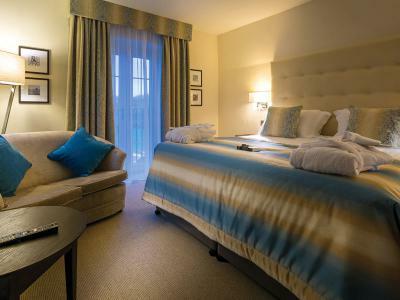 Family rooms can accommodate a maximum of 2 adults and 2 children. Contemporary style en suite bedroom offering free Wi-Fi, air-conditioning, 42" smart TV, digital radio, mini bar (complimentary soft drinks), laptop safe, writing desk, direct dial telephone, dataport, alarm clock, ironing station, trouser press, Illy coffee machine, mineral water, newspaper, bathrobes, slippers, toiletries (enhanced), hairdryer, and key card access. Larger than classic rooms. King-size bed. Contemporary style deluxe room offering free Wi-Fi, air-conditioning, 55" smart TV, digital radio, mini bar (complimentary alcoholic drinks), laptop safe, writing desk, direct dial telephone, dataport, alarm clock, ironing station, trouser press, Illy coffee machine, mineral water, newspaper, bathrobes, slippers, toiletries (enhanced), hairdryer, and key card access. Dedicated lounge area. King-size bed. Kindly note junior suites are not suitable for persons aged under 18 years. Contemporary style suite offering free Wi-Fi, air-conditioning, 55" smart TV, digital radio, mini bar (complimentary alcoholic drinks), laptop safe, writing desk, direct dial telephone, dataport, alarm clock, ironing station, trouser press, Illy coffee machine, mineral water, newspaper, bathrobes, slippers, toiletries (enhanced), hairdryer, and key card access. Separate lounge overlooking the sea. King-size bed. Kindly note deluxe suites are not suitable for persons aged under 18 years. 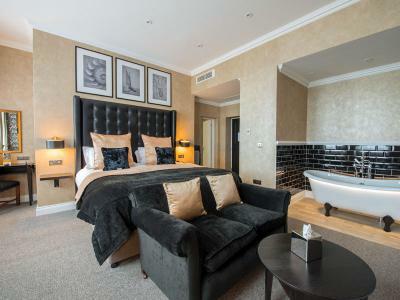 We say: The best room in the house, this sumptuously styled suite enjoys 180-degree uninterrupted sea views. Perfect for a romantic weekend away. 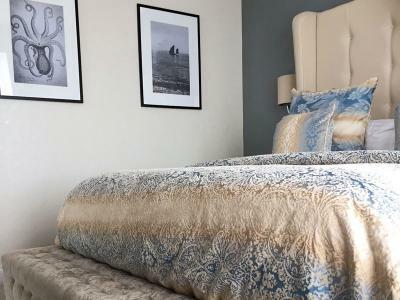 After relishing room service at your very own dining table, you’ll get a great night's sleep in the luxury Seventh Heaven bed, or perhaps you'll first want to sink into your regal roll-top bath. For a truly exclusive experience, you have your own entrance lobby and electric blackout blinds: Contemporary style suite offering free Wi-Fi, air-conditioning, 55" smart TV, Bluetooth surround sound system, mini bar (complimentary alcoholic drinks), laptop safe, writing desk, direct dial telephone, dataport, alarm clock, ironing station, trouser press, Illy coffee machine, mineral water, newspaper, bathrobes, slippers, The White Company ‘Noir’ toiletries, hairdryer, and key card access. Separate lounge overlooking the sea. King-sized bed. Accessible? 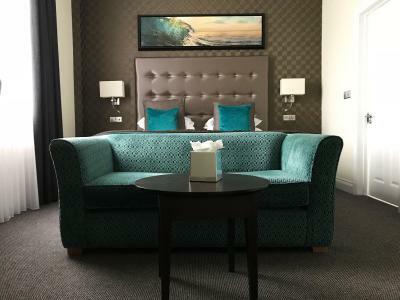 The Belcourt Suite is located on the third floor - with a single flight of stairs up to the mezzanine floor - and has a roll-top bath and walk-in shower. Kindly note the Belcourt Suite is not suitable for persons aged under 18 years. Take the M20 towards Folkestone. Passing Maidstone and Ashford, take junction 11 (A261) to Hythe. When in Hythe, follow signs to Folkestone. Turn right into Twiss Road opposite the Bell Inn, towards the seafront and the hotel. Cuisine at the Coast isn't over-elaborate - the head chef lets each dish's local flavours 'walk the walk' (on your taste buds). Fish is landed daily by fishmonger Griggs of Hythe and served up fresh in the Hythe Imperial's signature seafood platter. Tender cuts of meat are sourced from local butcher T&L Coopers in Ashford, and eggs from greengrocer Crundens of Hythe. The à la carte menu portions modern British cuisine by ‘The Sea,’ ‘The Land’ and ‘The Garden’ - a charming reminder that you’re surrounded by nature here in the Garden of England. Start with a seafood platter to share before moving on to sea bass. Or choose from the grill, with meats accompanied by portobello mushrooms, cherry vine tomatoes, fries and bearnaise sauce. To finish, the presentation of apples - tart tatin, apple sorbet, apple crumble and apple jelly - is delicious. A chilli and dark chocolate brownie, with organic rose petal ice cream, chocolate and garam masala reduction. “How does that work?” Ahha, this is the secret to The Holy Pundit's success. Melding traditional Indian cooking with innovative European techniques, The Holy Pundit is a fusion restaurant through and through. As you enter, you can’t help but notice its strikingly upholstered sofas and purple-painted walls. Bold, explosive flavours are matched by equally confident décor. Order a large glass of Davenport Vineyards Horsmonden, whose grapes are organically grown on Kentish soil, whilst choosing from the menu - a starter from the tandoor, perhaps, followed by the Kerala-style wild boar stew and topped off with said chocolate brownie? Come summer, open the patio doors and The Holy Pundit's outdoor terrace mixes sunbeams with spice. Not your everyday curry house. Please reserve your table in advance. Picture the scene... You've spent a glorious day exploring Kent's heritage coast, or perhaps you've been tucked up in the spa. It's now officially l'heure de l'apéro (the French version of the cocktail hour). And so it is that Moët & Chandon invite you to sit down, relax and whet your appetite before the focal point of the evening - dinner. Take a sea view seat and a glass of chilled Moët, or 'liquid luxury' as it’s aptly called. Browse the champagne, cocktail and tapas menus and choose from a selection of delicious sharing plates and complementing drinks. Is there anything more perfect than deliberating between a glass of Ice Imperial Rosé (served over ice, the latest way to enjoy your champagne) and a French martini, perhaps with a side of scallops, or some local rock oysters? Don’t miss the opportunity to indulge in afternoon tea whilst staying in this glorious setting - savour homemade scones with fruit preserve and cream, sandwiches, cakes and a pot of tea (more than 10 selections available). Both traditional afternoon tea and champagne afternoon tea are available to order, served in Victorian-style china and enjoyed in the afternoon tea parlour overlooking the gardens. A deliciously deviant chocolate afternoon tea can also be taken - chocolate scones, chocolate dip, chocolate brownie, dark chocolate profiterole, chocolate macaroon and mini-chocolate muffin. Afternoon tea can be booked in advance, at a special price, when booking your room via ClassicBritishHotels.com. Whether it's beef, chicken, or cod loin, all cooked to perfection by an award-winning team, Sunday roast is a favourite classic British tradition of ours. Start with a leisurely lap of the pool, and finish on the sweet-toothed note - chocolate tart served with salted caramel ice cream. Mmmake Sunday your sabbath. 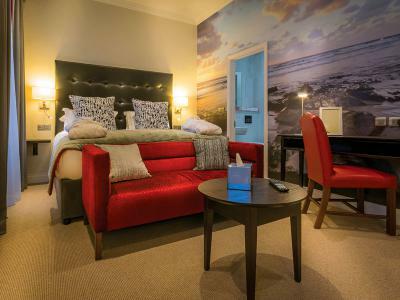 Dip and dine on the Kent Coast at the Hythe Imperial. The unique surroundings of the Hythe Imperial Hotel present a wonderful setting for private dinners and celebrations. The hotel caters for reunions, anniversaries, family gatherings, birthday parties, charity and club events, and business dinners. Choose from a range of private rooms, each with its own individual character. Call Classic British Hotels on 0844 967 0984 for advice and let us help you organise a memorable private dinner. The spa at the Hythe Imperial Hotel offers a secluded space to relax and revitalise. Highly experienced, ESPA-trained therapists pamper with sensuous treatments including 'in expert hands' (an age-defying facial) and holistic therapies such as reflexology and Indian head massage. There are five treatment suites, a hot stone relaxation area, a quiet area, and a lounge area where guests can enjoy a glass of chilled champagne or a light lunch. The health club features a heated indoor pool and an air-conditioned Life Fitness gymnasium with the latest cardio equipment. A full range of spa treatments, using ESPA products, are available to book. Set in the Kent Downs, an Area of Outstanding Natural Beauty, Hythe Imperial Golf Club enjoys breathtaking sea views. The 9-hole, 18-tee track is bounded on one side by the English Channel and on the other by the Napoleonic Royal Military Canal. Hard-to-gauge coastal winds and strategically placed bunkers make this gem of a course a unforgiving yet rewarding challenge. Fondly known as 'Kents mainline in miniature,' the Romney, Hythe and Dymchurch Railway (RHDR) comprises one-third full-size steam and diesel locomotives that roll and rumble along the 13.5 mile track starting at the coastal market town of Hythe and finishing in the Dungeness, a National Nature Reserve. With four stations en route within walking distance of a beach there are glorious coast and country walks to be taken in this astonishingly beautiful corner of Kent. All aboard! The foot of the Kent Downs surrounds the market town of Hythe and is characterised by a large arch of chalk that sweeps across Kent and forms the most important geological feature of the area. The whole of the Dover and Folkestone White Cliffs are defined as Heritage Coasts. One of the world's most famous sections of coastline, the magnificent high chalk cliffs of Dover look out onto the English Channel. Used for defence in both World Wars, visitors can see the Fan Bay Deep Shelter tunnels hidden deep within the chalk. Since the Middle Ages, pilgrims and visitors have been welcomed to Canterbury Cathedral. Famously, Archbishop Thomas Becket's murder at the Cathedral, in what is now known as the martyrdom, was immortalised in Geoffrey Chaucer's Canterbury Tales. Today, the magnificent structure stands as part of a Unesco World Heritage Site. Visitors can explore the walled precincts; marvel at the knave, a stunning example of English Perpendicular Gothic; admire the stained glass of the quire and trinity chapel (there is over 1,200 square metres of stained glass in the Cathedral); and discover the 11th Century Romanesque crypt. Journey through 900 years of captivating history at the 'loveliest castle in the world'... Set amidst 500 acres of beautiful parkland, Leeds Castle has been home to England's royalty, lords and ladies for almost 900 years. The first stone castle was built on an island in the River Len in 1119 by a Norman baron during the reign of William the Conquerors son Henry I. In 1278, a century and a half later, it came into the possession of Queen Eleanor of Castile, first wife of Edward I and became one of his favoured residences. For the next 300 years the castle remained a royal residence and was the private property of six of Englands medieval queens. Henry VIII also transformed the castle in 1519 for his first wife, Catherine of Aragon. It later became a private home and was handed down over four centuries, by both inheritance and purchase, through a network of interlinked families. The Hon. Olive, Lady Baillie, a wealthy Anglo-American heiress, was the last private owner of the castle. Upon her death in 1974, in accordance with her wishes, the castle was left to the Leeds Castle Foundation, and kept as a living house, with bedrooms that regularly accommodate guests. As such, it quickly became an elegant, early 20th century retreat for the influential and famous. Today, Leeds Castle is one of the most visited historic buildings in Britain where visitors are offered a glimpse into its rich past through its fine collection of art, eclectic mix of period architecture, sumptuous interiors and family treasures. A packed programme of events and exhibitions throughout the year, including the brand new exhibition 'What the Butler Saw', ensures a visit to Leeds Castle is filled with fun, colour, nostalgia and pageantry. Children will love the Knights' Realm Playground, Maze, Grotto and Toddler's Play Area and can take a ride on Elsie the Castle Land Train or the Black Swan Ferry Boat. Inspiring sea views over the English Channel, 18th Century Victorian grandeur, and extensive gardens and grounds are just some of the reasons why the Hythe Imperial Hotel stands out as a unique meeting venue in the ‘Garden of England.’ Pre- or post-meeting, guests can relax in the hotel spa and health club, play a round of golf on the on-site links course, or grab a snack in one of the lounge bars. 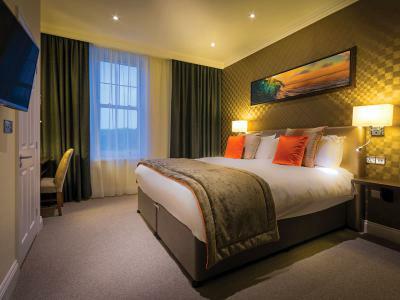 The Hythe Imperial Hotel has four flexible meeting spaces, including a grand Victorian ballroom (renovated in 2014) that opens out onto a sun deck with spectacular views of the English Channel. Adorned with large, ornate mirrors and traditional, decorative drapes, the air-conditioned ballroom has a dedicated breakout area and can seat up to 200 guests. Free Wi-Fi and LCD projectors feature in all meeting rooms. The Hythe Imperial Hotel is just 4 miles from junction 11 of the M20 with easy access to Canterbury, Dover and Folkestone. Less than 1 hour from London by train and just 10 minutes from the Folkestone Eurotunnel Terminal, the Hythe Imperial Hotel is perfectly positioned for your next meeting or event. There is free parking on-site.